Just when we all thought that it’s over, The Philippine Marine Corps, together with the LakasPilipinas Team are gearing up for the Marine Birthday! WHERE: Marine Base Gregorio Lim, Ternate, Cavite. “NOVEMBER: a month when every Marine from all over the world celebrates its birthday. Unknown to many, it is a month long celebration filled with sacred traditions done to uphold the unsung heroism of those who went ahead dignified up to their last breath, and for those still in active duty but whose lives are already half given as sacrifice for the good of many. For the past 63 years, Philippine Marine Corps’ birthday celebration has been held within its bounds excluding the non-military. This year however, working in line with the government’s thrust in winning the peace thru the effort of all, the PMC is enticing those who are willing to observe and get to know the dynamism of this noble organization to participate and eventually help in the organization’s cause. One of the highlights of this year’s PMC’s 63rd birthday is the Karera Lakas Pilipinas which will be held on November 09, 2013 at Marine Base Gregorio Lim, Ternate, Cavite. The same event, Karera Lakas Pilipinas, was recently held at the very ground where a Marine is shaped and harnessed to his core. The appreciation of the civilian participants was astonishing as they were made to experience what it takes to be a marine even for a short period of time. There is an overwhelming demand for a repeat from those who participated and from those who heard about the elated feeling in conquering the challenging obstacles. These events are the doors being opened by the PMC to individuals like you. We are cordially inviting you to “come in” and be part of the Marine 63rd birthday celebration. We would appreciate if you could support us by pledging your strength and be a LAKAS KARERISTA for this event. Proceeds will be used to continue the reconstruction of the Warrior’s Grill Obstacle Course, the ground that makes our Marines as the Force of Choice, the Force in Readiness"
This event is supported by Cobra Energy Drink, R.O.X., RUNNR, Toby's Residencia Boracay, Rudy Project, Finix Inc, Absolute Fitness, Olive Juice Concepts, PaymentPassage, Goofy Foot Media, SJF Wealth Management and Merrell. 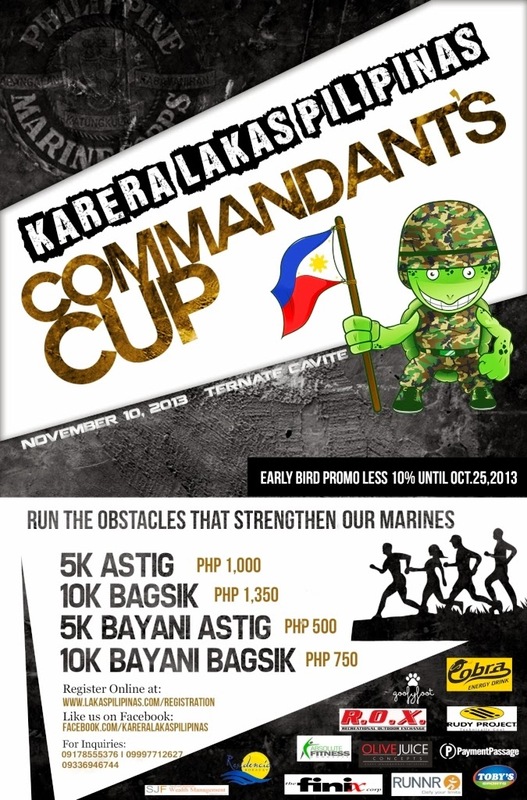 For more information, subscribe to www.facebook.com/kareralakaspilipinas and TRAIN ON!